© 2002, © 2018 by Paul Freeman. Revised 4/26/18. A 1956 aerial view looking northwest at the Hurricane Mesa test track (courtesy of Tim Tyler). capable of safely extracting a pilot from high-speed aircraft. to construct the Supersonic Military Air Research Track to test ejection seat systems. 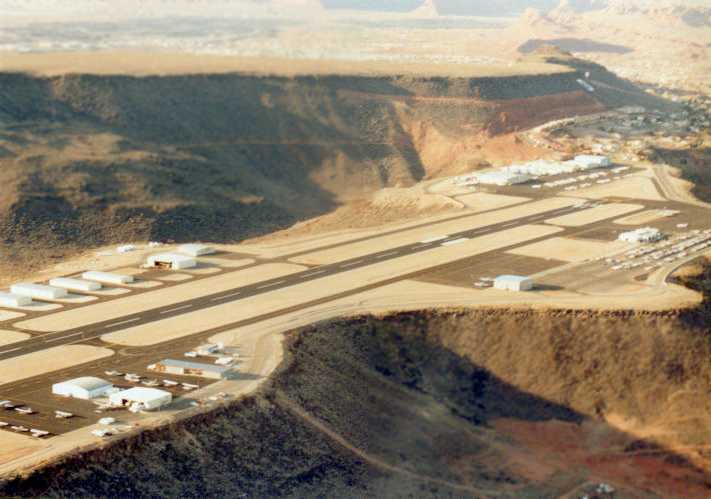 The Air Force selected the flat, arid Hurricane Mesa in southern Utah as the location for the facility. The location proved to be ideal. and the Virgin River supplied all the necessary water. 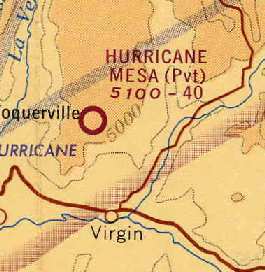 The 1954 USGS topo map did not depict anything at the Hurricane Mesa site. Coleman Engineering began construction of the facility during the summer of 1954.
that formed the longest rocket research track in the United States to that date. communication system, security facilities, administration building, and a shop building. Coleman's first test was run on 7/8/55. along the track at a speed of 1,050 mph (Mach 1.3). with electronic equipment & a radio connected to it. 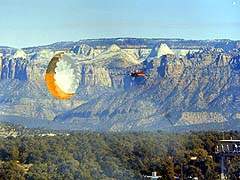 flinging the dummy over the precipice where its parachute opened & it floated to the valley floor. In one series of tests "Hurricane Sam" was replaced by apes to determine the effects of ejection on live beings. 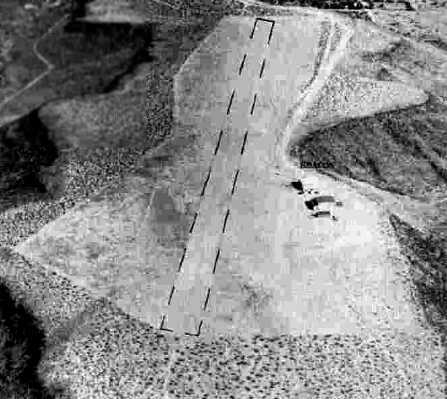 The earliest depiction which has been located of the Hurricane Mesa test track was a 1956 aerial view (courtesy of Tim Tyler). 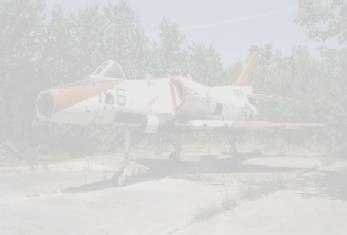 It did not yet depict any airfield at the site. 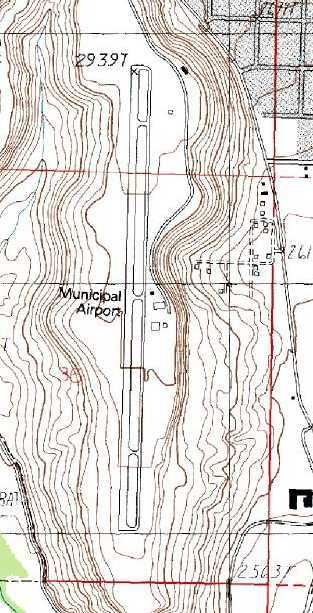 The 1956 USGS topo map depicted neither the test track nor the airfield. including the launching of missiles from the rocket sled at targets 75 miles away. when the 9,400-pound sled reached a speed of 1,800 mph. and many of Coleman Engineering's innovations were adopted by various industries. An undated (circa 1955-61 photo of a Coleman test nose section of a Boeing B-52 bomber at the Hurricane Mesa test track (courtesy of Tim Tyler). A 5/10/59 photo of Coleman's UT test track by Norvin Alcorn (courtesy of Steve Alcorn). A 5/10/59 photo by Norvin Alcorn of a Convair F-102 Delta Dagger test fuselage on the Coleman's UT test track (courtesy of Steve Alcorn). 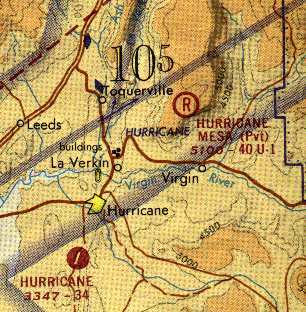 The September 1960 Grand Canyon Sectional Chart did not yet depicted any airifeld at Hurricane Mesa. 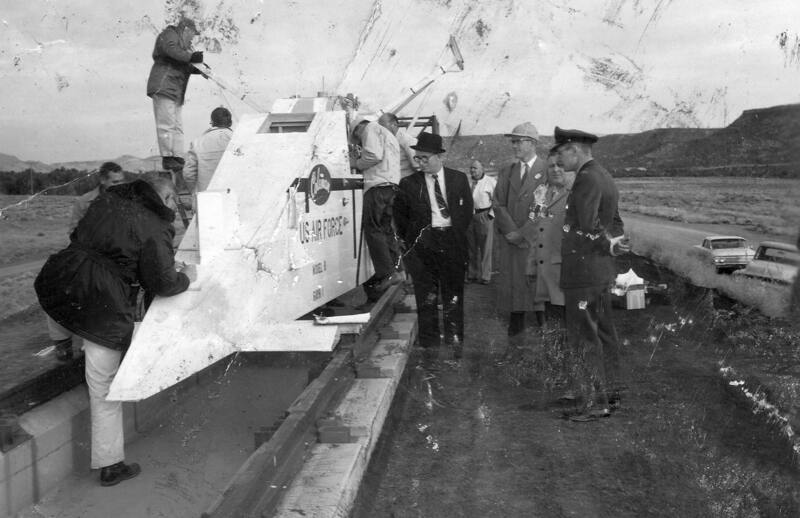 A 1/25/61 photo of an unidentified sled test at Coleman's Hurricane Mesa facility (courtesy of Louis Ayala). Louis Ayala reported, “I lived just a few minutes from the Coleman Engineering Office in Torrance. One of my cousins was making a delivery to a local landfill & a photo blew across his path while he was unloading. and perfect a seat that made emergency escapes much safer for American pilots. and the Air Force ceased operations on 12/30/61. 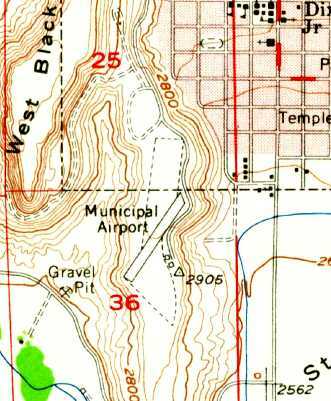 No airfield was yet listed at the Hurricane Mesa site in the 1962 AOPA Airport Directory. 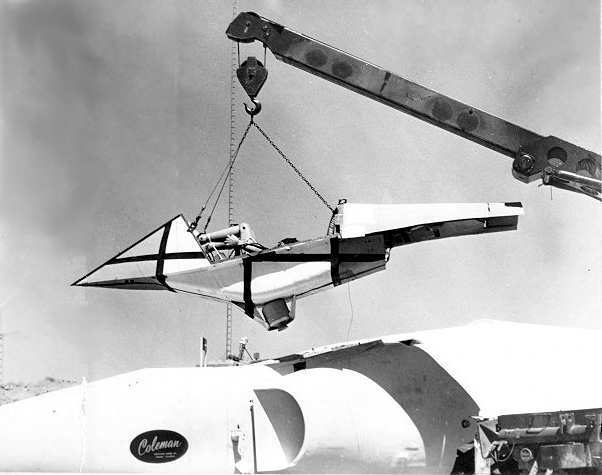 the track & facility were bought by Stanley Aviation Corporation of Denver in 1963.
being loaded into what appears to be an F-102 Delta Dagger nose section (with a “Coleman” label), presumably at Hurricane Mesa. participating in many flight test & engineering programs including the Bell X-1 & X-2 aircraft. The Stanley company designed & built many diverse products prior to entering into the escape & egress engineering field. downward ejection seats, upward ejection seats, supersonic ejection capsules, and prototype ejection systems. XF-104, F-104, YB-47, FJ-2, F-106A, F4H, P6M, B-58, and other prototypes. originally developed for the Convair B-58 Hustler, but also tested for adaptation to other aircraft (including the F-4). 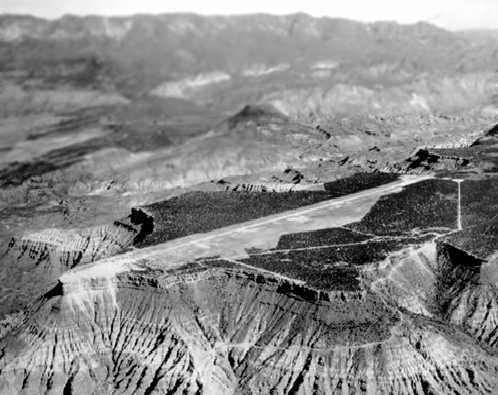 At some point between 1962-65, Stanley developed an airfield at the Hurricane Mesa site. The earliest reference to an airfield at the site came from John Lowry. He recalled, “I had the opportunity to land & take off from that airport with Bob Stanley in July 1965. Bob Stanley was a river rat and he & my father ran many of the rivers of the Southwest during the 1960s. My father loved the outdoors & because he was an excellent outdoor cook Bob wanted him on the trips. and Bob stopped at Hurricane Mesa to pick up a camera & equipment to take back to Denver. I remember the runway as unpaved with a road barrier at the end. We had a great time looking around the mesa & its rocket sled track. Bob used old jet engines to propel the sled. I would like to have seen a test, but I don’t think anything was planned. He only had one maintenance man on the mesa at the time. Bob had the Aerocommander fully loaded & I didn’t think we were going to get off the ground before hitting the barrier. Stanley's first test was run on 5/29/65. Hank Pesch recalled, “I worked for Stanley Aviation from 1966-79. Stanley Aviation leased the site from the government. to test & qualify the Yankee Escape Systems & its various derivatives. The Yankee Escape System was used primarily on A-1E, A-1H/J and T-28 Trojan aircraft during the Vietnam conflict. for the Navy's A3B & EA-6B aircraft & the Army's Mohawk aircraft. for a method of crew escape if something went wrong during deep stall test. The Away System provided a means of escape for up to 6 people on the test aircraft. by the company that bought the rights to all of Stanley's escape systems after his untimely death. which instead opted for the extendable barber pole which is on the Space Shuttle today. 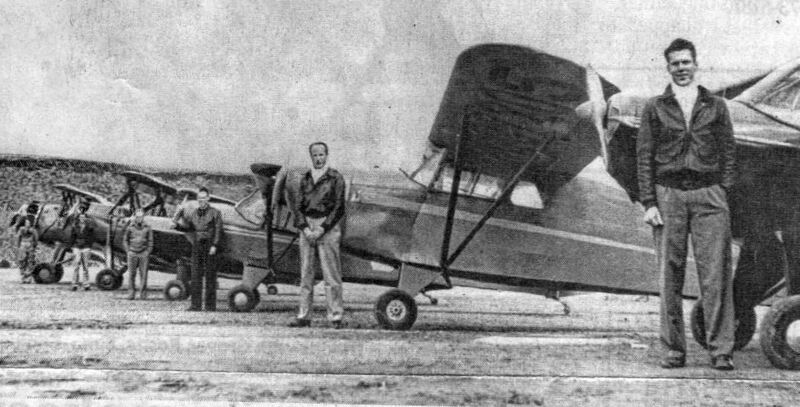 Stanley had a fleet of company aircraft that were flown from Denver to the test site on a regular basis. The aircraft shuttled personnel & equipment to support test operations. rather than having to land at Saint George or the local airport at the town of Hurricane. was on the 1965 Grand Canyon Sectional Chart (courtesy of Chris Kennedy). It depicted Hurricane Mesa as a private airfield having a 4,000' unpaved runway. depicted Hurricane Mesa as a private airfield with a 4,000' unpaved runway. 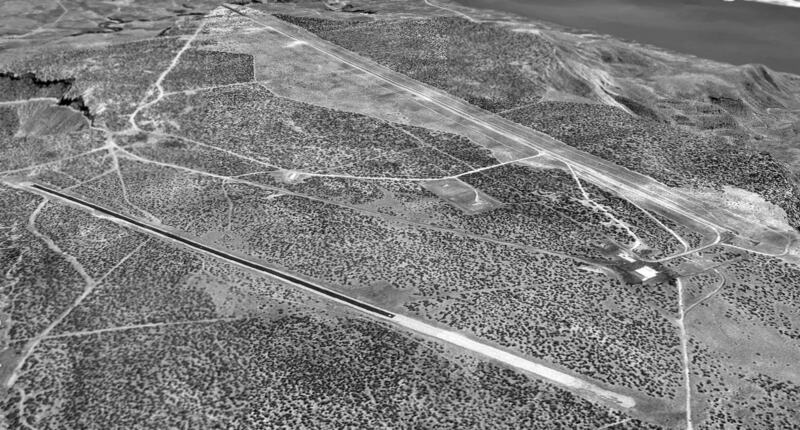 The earliest photo which has been located of the Hurricane Mesa Airfield was an 8/27/73 USGS aerial view. The single unpaved runway appeared to be the only aviation infrastructure at the site - there did not appear to be any ramp or hangars. the track & facility were bought by Stencel Aero Engineering of Asheville, NC in 1981. Stencel's first run was 10/29/81. 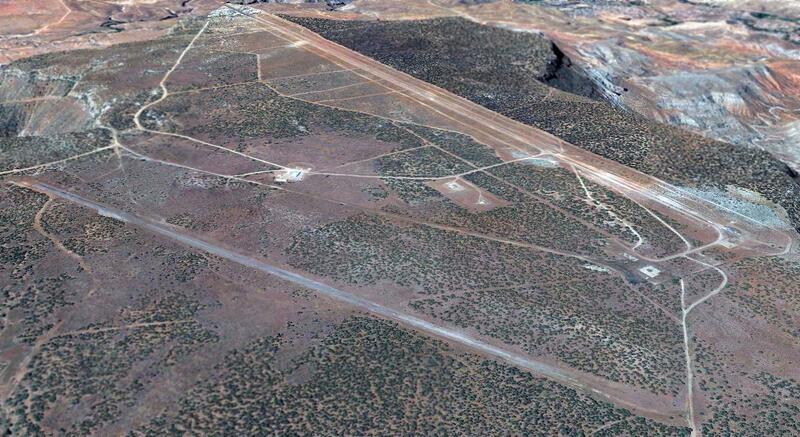 described Hurricane Mesa Airport as having a single 5,000' asphalt Runway 15/33. The remarks said, "Private. Use at own risk." and Stencel's last of 73 tests was run on 2/27/86. Talley Industries merged Stencel Aero Engineering Corporation into Universal Propulsion Company at the end of May 1986. UPCO's first test was run 7/1/86 and their last of 256 tests was run on 6/27/97. In February 1998 Talley Industries sold UPCO to Carpenter Technologies. and their last of 21 tests was run on 8/20/98. Goodrich bought UPCO from Carpenter Technologies on 10/19/98. UPCO's first test under Goodrich ownership was run on 2/4/99. 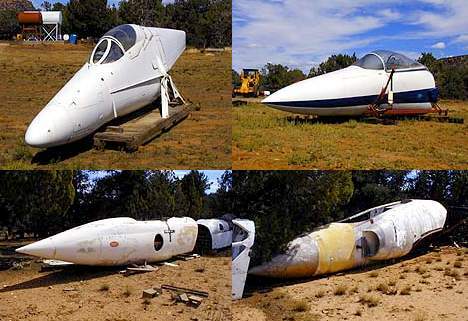 including canopy removal, sequencing systems & the ejection seat." The Universal Propulsion web site describes the track as "fully capable of handling propulsion velocities exceeding supersonic. and would cruise right by the mesa & the track at about 7,500+ feet. and do a few low passes over the facility down to a few hundred feet off the top. I saw that even though the track was there, it was unusable due to a huge pile of earth mounded up in the middle. I found the 2-lane entry road & drove up to the top of the mesa. sections of it are missing from landslides & it is down to one lane (or less). I was able to squeeze by in my Toyota Celica with my wife commenting on my sanity. which was locked with a chain & huge rusted padlock. At one time, it was an automatic gate as evident by the power gate swing mechanism. An undated view of the gate to the Hurricane Mesa Test Track. 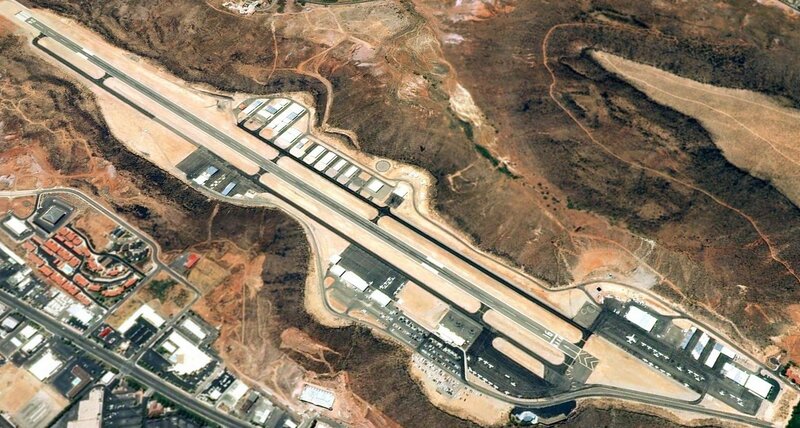 An undated aerial photo of the Hurricane Mesa Test Track & Airport. 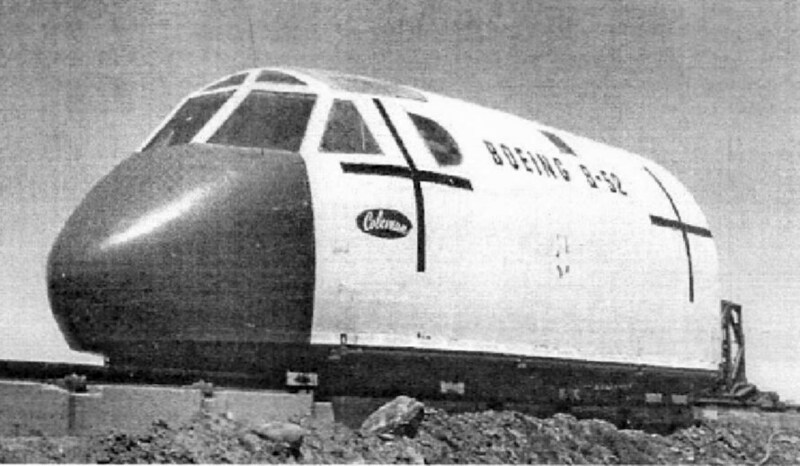 An undated photo of a test article being retarded by a parachute at the Hurricane Mesa Test Track. of an F-15 Eagle, A-4 Skyhawk, and F-102 Delta Dagger. A 1993 USGS aerial view looking southwest at the Hurricane Mesa Test Facility, with the abandoned runway in the foreground & the test track in the background. The single runway appeared to be the only aviation infrastructure at the site. There did not appear to be any ramp or hangars. the "R & D Range" (blue), and "OB / OD Range" (pink). described it as a private airfield consisting of a single 5,000' gravel Runway 15/33. and the remarks said, "Airport hazardous due to winds." 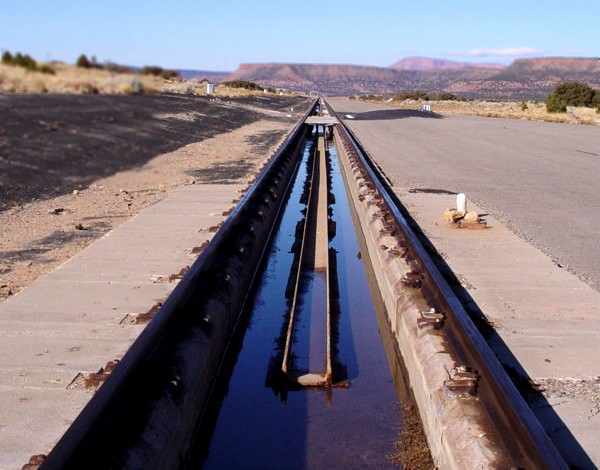 A 1/22/06 view along the Hurricane Mesa test track. was known as Aircraft Interior Products Propulsion Systems, a wholly owned subsidiary of Goodrich Corporation. 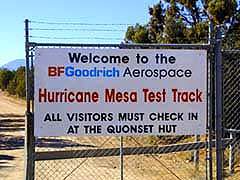 Hurricane Mesa is described by the company as “The nation's only privately-owned supersonic test track. 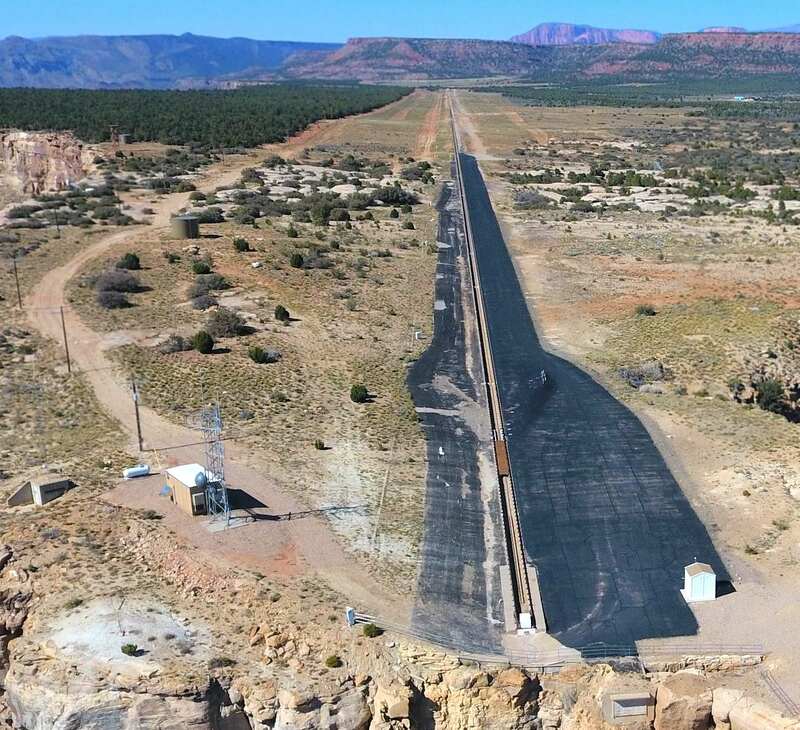 Located atop Hurricane Mesa, the 12,000' track is fully capable of handling propulsion velocities up to supersonic. The track level is at 5,100' MSL with the muzzle terminating at a 500' vertical cliff. The sloping terrain of the mesa provides an additional drop of 1,000' to the valley floor below. 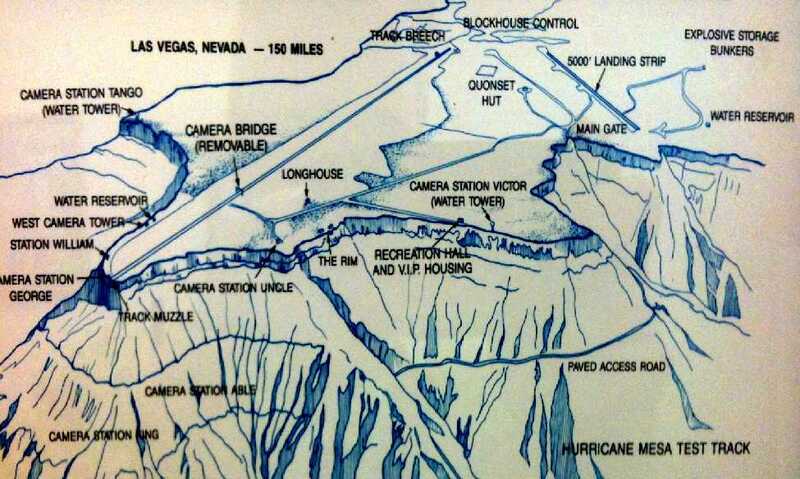 Hurricane Mesa Test Facility has been used as a shooting location for several motion pictures. most likely an indication of the property's ownership (as Universal evidently leases the site from the government). 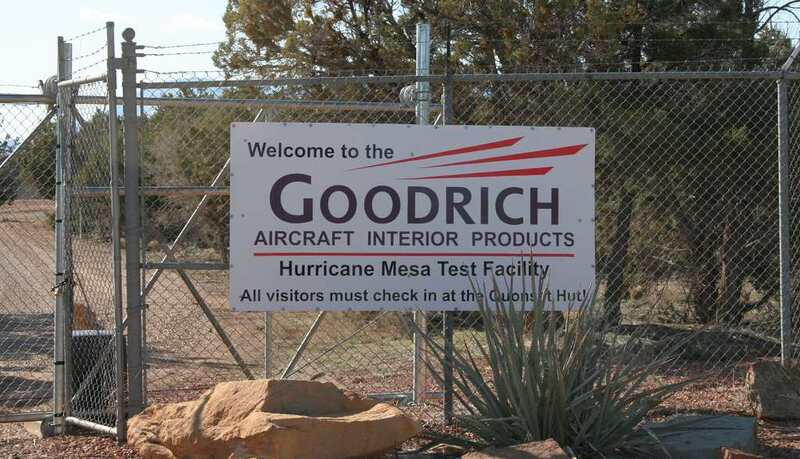 A 3/27/10 photo by Tim Tyler of the sign on the gate of the Hurricane Mesa Test Track. 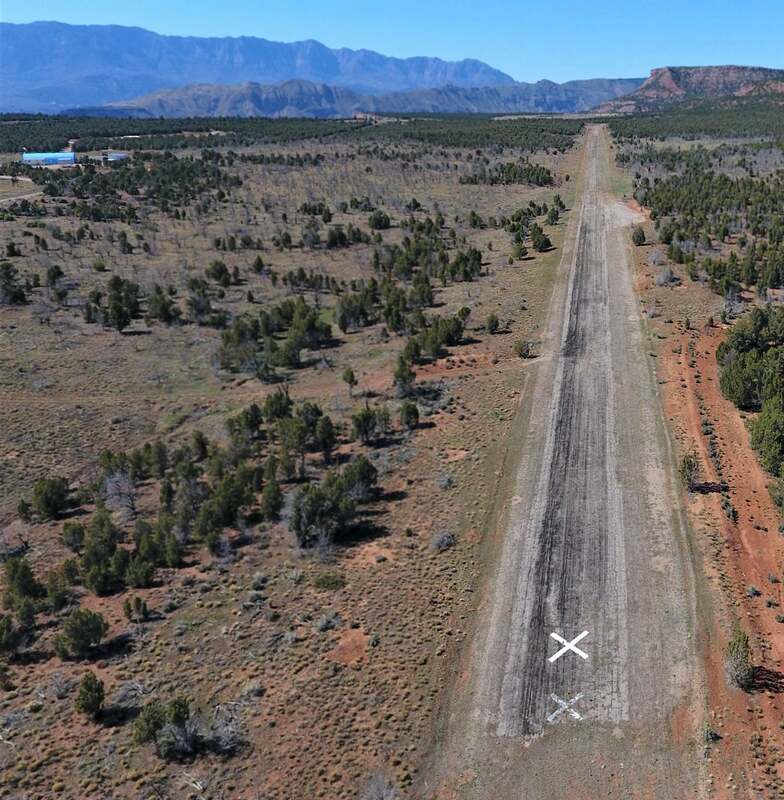 A 2012 photo by Tim Tyler looking north-northwest along Hurricane Mesa's paved runway, showing the closed-runway X symbol. Tim noted, “Each end of the paved runway have a gravel overshoot area. Tim Tyler reported in 2012, “As of Fall 2012, the landing strip is now longer used & hasn't been in at least several years. However, UTC Aerospace Systems still lists a 6,000' paved runway as a benefit of their test facility atop Hurricane Mesa. However, a video promoting HMTF only indicates using Las Vegas or St George Airports. The former airfield is not at all visible from the public BLM or USFS roads, due to trees, but it still shows up well on aerial imagery. but due to barbed-wire fencing, I had to park the motorcycle & walk a couple dozen yards to the airfield. I then ended up spending about 2 hours walking up & down the entire airfield. 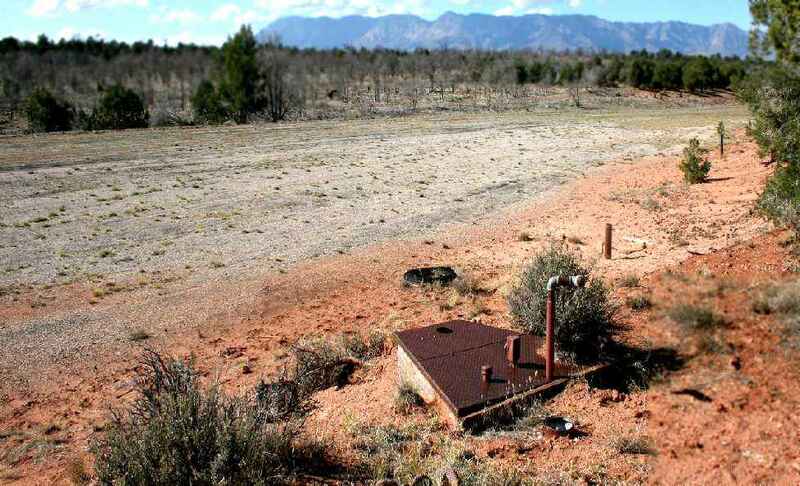 A 2012 photo by Tim Tyler looking west at what is presumed to be an aircraft refueling station along the east side of the midpoint of Hurricane Mesa's runway. 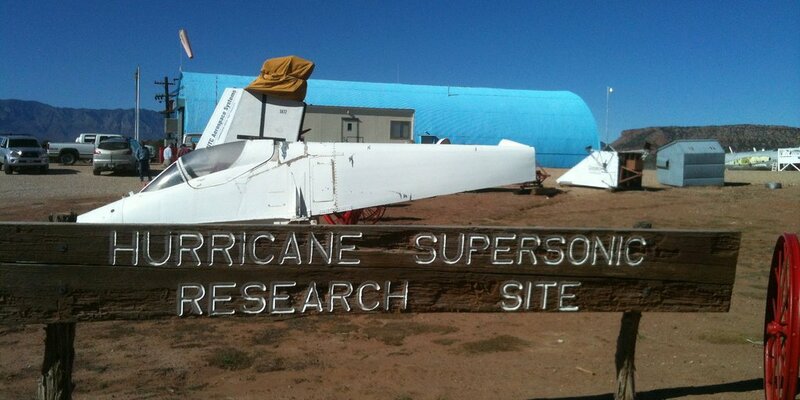 A 10/19/12 photo by Tim Tyler of an A-4 Skyhawk test fuselage at the “Hurricane Supersonic Research Site”. A 2017 aerial view looking southwest at the Hurricane Mesa Test Facility, with the abandoned runway in the foreground & the test track in the background. A 3/29/18 photo by Paul Freeman looking north at Hurricane Mesa, taken from across the valley from the top of Gooseberry Mesa. A 4/14/18 drone aerial view by David Birkley looking northwest at the Hurricane Mesa Test Facility runway. A 4/14/18 drone aerial view by David Birkley looking northeast at the Hurricane Mesa Test Track. 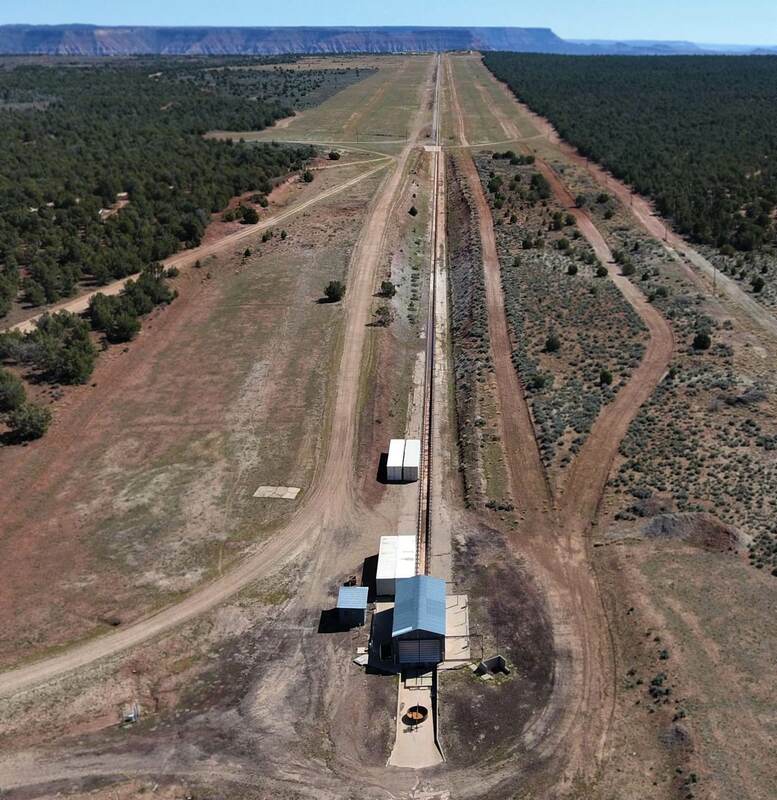 A 4/14/18 drone aerial view by David Birkley looking southwest at the Hurricane Mesa Test Track. 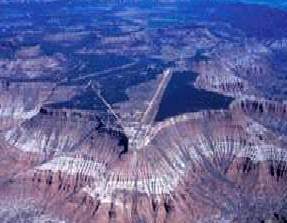 The Hurricane Mesa facility is located 5 miles north-northwest of Virgin, UT. 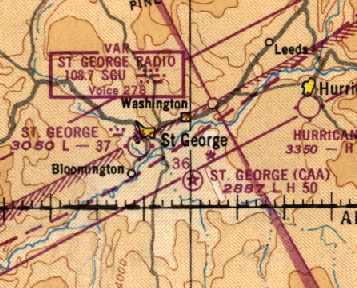 The original St. George Municipal Airport, as depicted on the December 1935 Grand Canyon Sectional Chart. 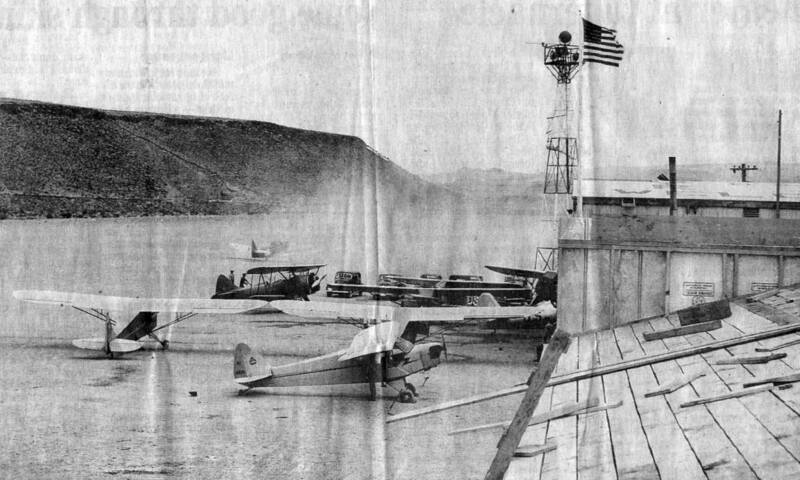 The original airport for the town of St. George was located adjacent to the southwest side of the town. 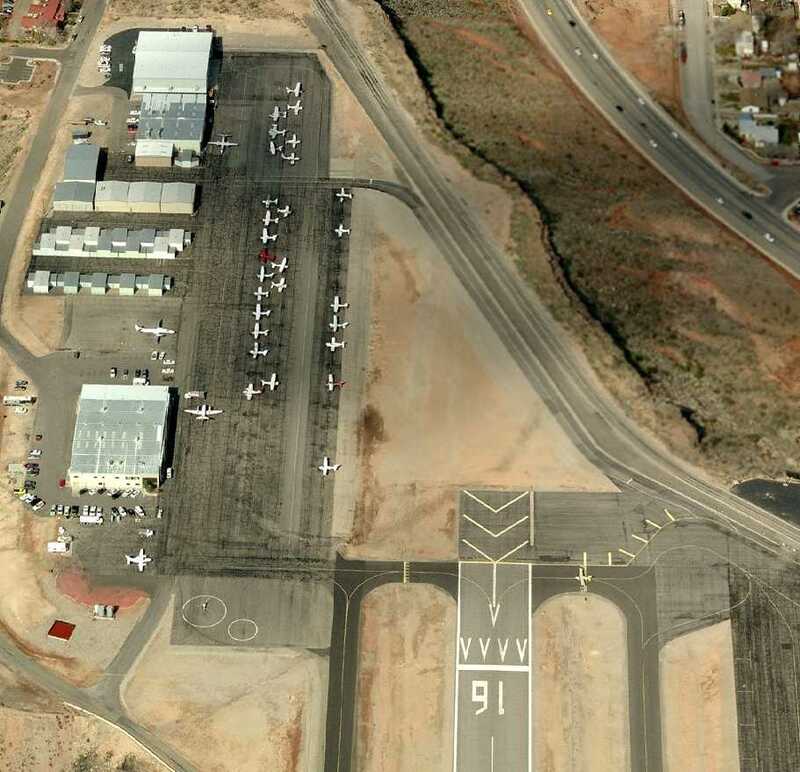 The date of establishment of the St. George Municipal Airport has not been determined. 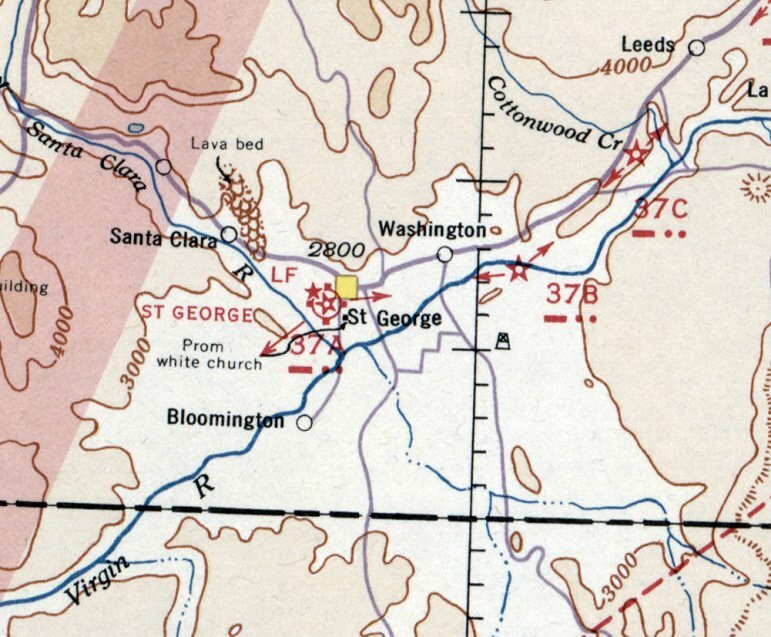 was on the December 1935 Grand Canyon Sectional Chart. It also depicted the field as having Commerce Department Beacon # 37A. 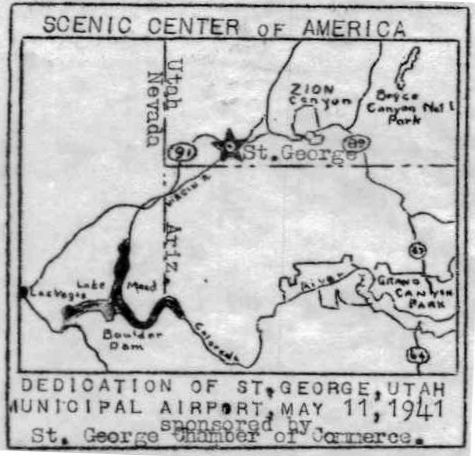 described St. George as the Department of Commerce's Site 34 along the Los Angeles – Salt Lake Airway. consisting of a 34 acre irregularly-shaped field, containing a single 3,000' gravel runway. St. George Airport was listed in The Airport Directory Company's 1938 Airports Directory (according to Chris Kennedy). even though the airport had been in existence for at least 6 years by that point. 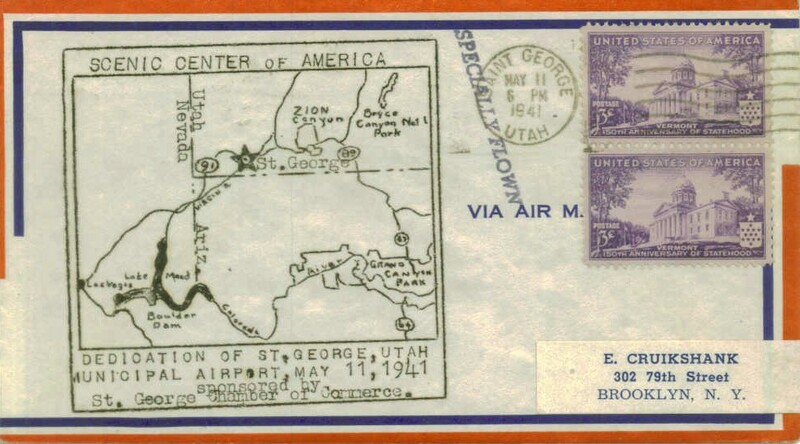 It depicted St. George as a single unpaved runway along a flat plateau, with a few small hangars along the southeast side. showing a Piper Cub & several other light monoplanes & a biplane. A WW2 era of instructors of St. George's Civilian Pilot Training program in front of their aircraft (courtesy of Tim Tyler). The federal government decided to build an additional airport, 5 miles southeast of the town, in 1944.
as a Civil Aeronautics Administration (CAA) Intermediate Airfield." as a 120 acre irregularly-shaped site having a single 3,690' north/south gravel runway. to be owned by private interests, and operated by the City of St. George & private interests. was on the September 1949 Great Salt Lake World Aeronautical Chart (courtesy of Donald Felton). somewhat different from the eventual (north/south) runway orientation. Two small buildings were depicted to the southeast of the runway. 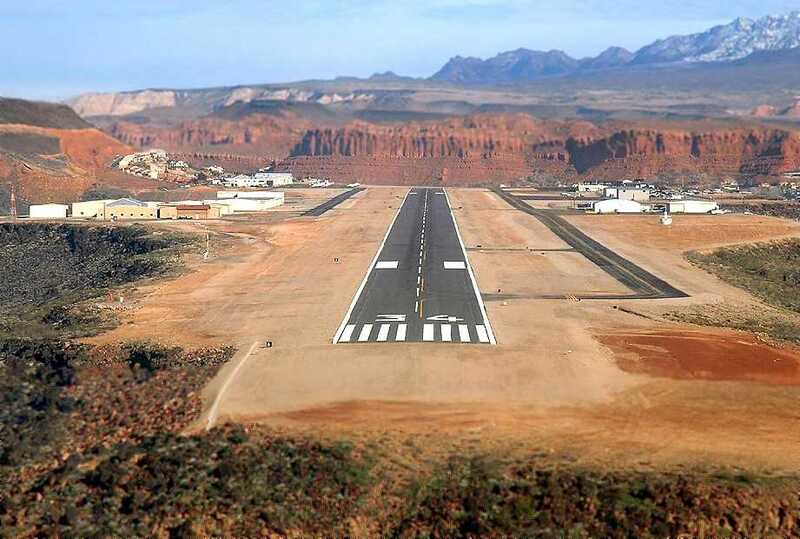 depicted the St. George Airport as having a single 5,100' paved runway. The runway orientation was depicted as north/south, in contrast to topo map depictions. According to David Ulane, the FAA Airport to the southeast was closed in 1961.
depicted St. George Airport as having a 5,100' paved runway. The other (FAA) airport to the southeast was depicted as an abandoned airfield. 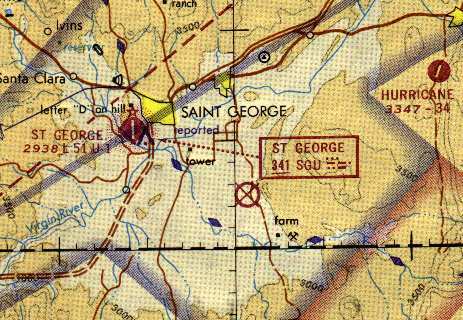 The 1977 USGS topo map continued to depict St. George Municipal Airport as having a northeast/southwest runway. 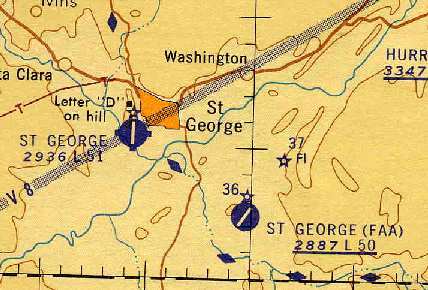 The 1981 USGS topo map depicted St. George's runway as being oriented north/south. and a few small buildings on the east side. including ramps and hangars on the northeast & northwest sides. 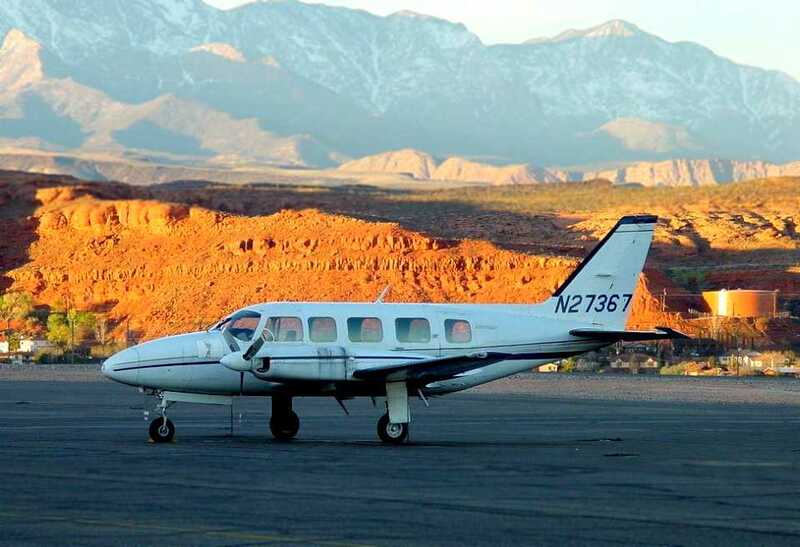 A beautiful March 2001 photo by Colin Abbott of a Piper PA-31-350 Navajo Cheftain at St. George Municipal Airport. prohibit needed expansion to accommodate large commercial service & commercial jets. as the preferred site for a replacement airport." David Ulane reported in 2003, "The City of St. George is indeed pursuing the construction of a new airport. and is severely constrained by the geography of the mesa. and we have virtually no room left for additional hangars or development. which is now surrounded by the City of St. George. with the new Runway 4/22 planned to begin at the north end of the old CAA runway. Too bad our City didn’t turn it into an airport back in 1961! 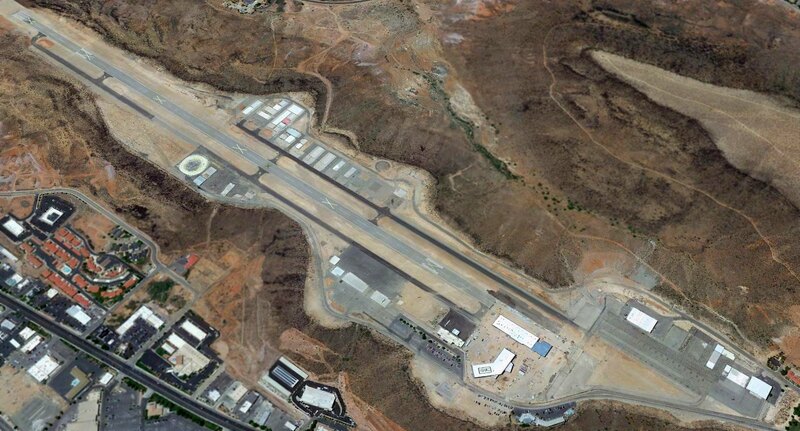 which is expected to be operational in 2010.
including the old 'FAA airport'." A beautiful 1/16/05 aerial view by Brett Wirick while on final approach to St. George's Runway 34. A circa 2006-2010 aerial view looking north at St. George's northwest ramp. showing the sharp drop-off of the plateau. 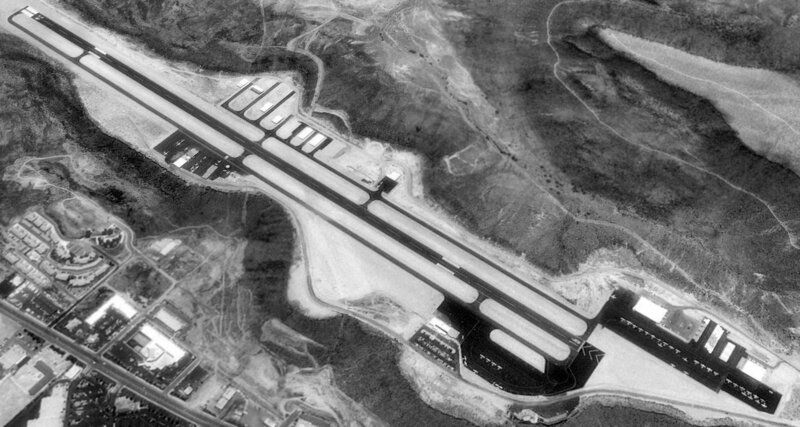 The last photo which has been located showing the original St. George Municipal Airport in operation was an 8/28/09 aerial view looking southwest. was on the August 2010 Las Vegas Sectional Chart. 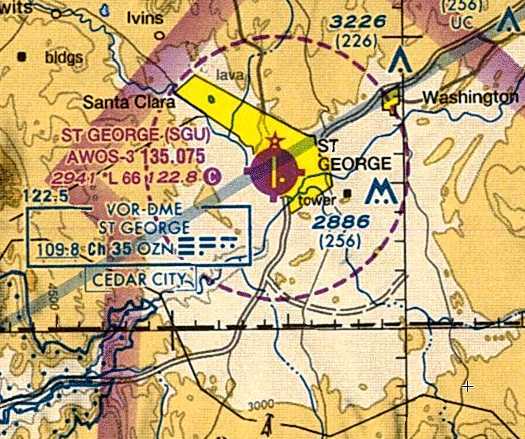 which had been built over the site of the old St. George FAA Airport to the southeast. ”The front doors to the terminal building at the old airport were open Friday afternoon, but no one was home. a busy building full of passengers waiting for flights & loved ones waiting for returning passengers. and the lively airport at­mosphere had transformed into the eerie kind of quiet that tends to fill up movies about life after the end of the world. “There are no lights, the power is off. There are no more regu­lar operations,” Airport Manager Rick Crosman said. The article continued, “Pilots who still have planes at the airport have until Monday to take off at their own will, as long as it’s between 8am-5pm. “We still have some planes up there and will give everybody some reasonable time to get out of there,” Crosman said. The article continued, “Pilots have until March 9 to clear the airport completely. “It wasn’t a good business decision to sell at this time,” he said. “We saved a lot of money on construction costs so we were able to balance our budget,” he said. “It was a mixed use of residential, office and commercial type uses,” he said. A 2017 aerial view looking southwest shows the original St. George Municipal Airport remains mostly intact, although a building was being constructed over the north end of the former runway.